In Egyptian mythology, Taweret (also spelt Taurt, Tuat, Taueret, Tuart, Ta-weret, Tawaret, and Taueret, and in Greek, "Thoeris" and Toeris). Her name means One Who is Great. When paired with another deity, she became the demon-wife of Apep, the original god of evil. Since Apep was viewed as residing below the horizon, and only present at night, evil during the day then was envisaged as being a result of Taweret's maleficence. As the counterpart of Apep, who was always below the horizon, Taweret was seen as being the northern sky, the constellation roughly covering the area of present-day Draco, which always lies above the horizon. Thus Taweret was known as mistress of the horizon, and was depicted as such on the ceiling of the tomb of Seti I in the Valley of the Kings. In their art, Taweret was depicted as a composite of all the things the Egyptians feared, the major part of her being hippopotamus, since this is what the constellation most resembled, with the arms and legs of a lioness, and with the back of a crocodile. On occasion, later, rather than having a crocodile back, she was seen as having a separate, small crocodile resting on her back, which was thus interpreted as Sobek, the crocodile-god, and said to be her consort. Early during the Old Kingdom, the Egyptians came to see female hippopotamuses as less aggressive than the males, and began to view their aggression only as one of protecting their young and being good mothers, particularly since it is the males that are territorially aggressive. Consequently, Taweret became seen, very early in Egyptian history, as a deity of protection in pregnancy and childbirth. Pregnant women wore amulets with her name or likeness to protect their pregnancies. Her image could also be found on knives made from hippopotamus ivory, which would be used as wands in rituals to drive evil spirits away from mothers and children. In most subsequent depictions, Taweret was depicted with features of a pregnant woman. In a composite addition to the animal-compound she was also seen with pendulous breasts, a full pregnant abdomen, and long, straight human hair on her head. As a protector, she often was shown with one arm resting on the sa symbol, which symbolized protection, and on occasion she carried an ankh, the symbol of life, or a knife, which would be used to threaten evil spirits. As such a protector, Taweret also was given titles reflecting a more positive nature, including Opet (also spelt Ipet, Apet, and Ipy), meaning harem, and Reret (also spelt Rert, Reret, seen as the offspring of Nut). As the hippopotamus was associated with the Nile, these more positive ideas of Taweret allowed her to be seen as a goddess of the annual flooding of the Nile and the bountiful harvest that it brought. Ultimately, although only a household deity, since she was still considered the consort of Apep, Taweret was seen as one who protected against evil by restraining it. When Set fell from grace in the Egyptian pantheon, as a result of being favoured by the (xenophobically) hated Hyksos rulers, he gradually took over the position of Apep, as the god of evil. With this change away from Apep, Taweret became seen only as the concubine of Set. She was seen as concubine rather than wife, as Set already was married to the extremely different goddess, Nephthys, to whom no parallels could be drawn. It then was said that Taweret had been an evil goddess, but changed her ways and held Set back on a chain. As the goddess of motherhood, Taweret was eventually assimilated into the identity of Mut, the great-mother goddess. In Egyptian astronomy, Taweret was linked to the northern sky. In this role she was known as Nebetakhet, the Mistress of the Horizon - the ceiling painting of the constellations in the tomb of Seti I showed her in this capacity. She was thought to keep the northern sky - a place of darkness, cold, mist, and rain to the Egyptians - free of evil. She was shown to represent the never-setting circumpolar stars of Ursa Minor and Draco. The seven stars lined down her back are the stars of the Little Dipper. She was believed to be a guardian of the north, stopping all who were unworthy before they could pass her by. In all of the ancient Egyptian astronomical diagrams there is one figure which is always larger than all the rest, and most frequently found at the center of what appears to be a horizontal parade of figures. This figure is Taweret "The Great One", a goddess depicted as a pregnant hippopotamus standing upright. It is no mystery that this figure represents a northern constellation associated, at least in part, with our modern constellation of Draco the dragon. In the Book of the Dead Taweret, the 'Lady of Magical Protection', was seen as a goddess who guided the dead into the afterlife. As with her double nature of protector and guardian, she was also a guard to the mountains of the west where the deceased entered the land of the dead. Many of the deities relating to birth also appear in the underworld to help with the rebirth of the souls into their life after death. She was thought to be the wife of a few gods, mostly because of her physical characteristics. She was linked to the god Sobek, because of his crocodile form. 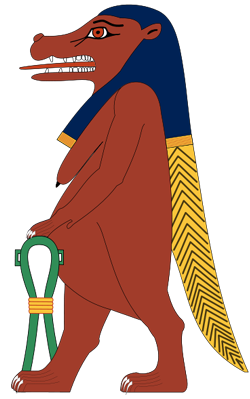 Occasionally Taweret was depicted with a crocodile on her back, and this was seen as Taweret with her consort Sobek. Bes, because the Egyptians thought they worked together when birthing of a child, was thought to be her husband in earlier times. At Thebes, she was also thought to be the mother of Osiris, and so linked to the sky goddess Nut. Another part of this theology was that it was Amen, who became the supreme god rather than Ra, who was the father of Osiris. It was believed that Amen came to Taweret (called Ipet at this particular time) and joined with her to ensure the renewal of the cycle of life. Ipet herself had become linked with the original wife of Amen, Amaunet (invisibility). It was at Karnak that she was believed to have given birth to Osiris. In later times, Ipet was assimilated by Mut who took her place as the wife of Amen and mother goddess. Plutarch described Taweret as a concubine of Set who had changed her ways to become a follower of Horus. In this form, she was linked to the goddess Isis. It was thought that the goddess kept Set's powers of evil fettered by a chain. This is probably because she was a hippo goddess while Set was sometimes seen as a male hippo. The male hippopotamus was seen by the Egyptians as a very destructive creature, yet the female hippopotamus came to symbolise protection. This is probably why Set was, in later times, regarded as evil while Taweret was thought to be a helpful goddess, deity of motherhood and protector of women and children.